This summer I am embarking on a new career journey. I am doing some educational consulting work with various school districts. When I thought about my favorite part of being a curriculum director, it always came back to professional development (either my own, or leading it for others). The difference with this new gig is that I will be going into districts where there is already a culture established. It’s exciting for me, because I love making new connections. I thrive on working with like-minded professionals. I’m passionate about sharing best practices in innovative teaching and learning. One of my friends does similar work, but in a different field. He has given me some great advice as I prepare for this new challenge. One thing he told me was, “Janelle, you have to be okay with other people taking credit for what you teach them. You work with them, train them, support them, but they get to lead the people in their organizations.” Then, I saw the above quote from Iyanla Vanzant and it just resonated with the advice from my friend. My goal is to help these teachers, administrators, and school systems be successful. The impact of my work will go further than I am aware. I do it because I believe in the power of education. I do it because I like to teach, and want to make a difference for today’s students. I do it to serve others. 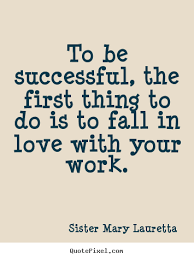 By doing so, I will be successful, and that is all the reward I need (well, ok, getting paid to do it is kinda nice, too).